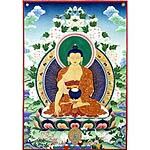 Maitreya, meaning 'Loving kindness', is the great bodhisattva who is destined to become the Buddha of our next era, and the fifth in line of the thousand Buddhas of the great epoch. 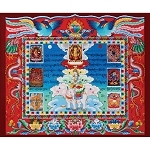 At present he resides in his Pure Land, which is known as Tushita (Tib. 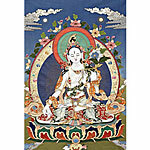 Ganden), and he may be represented either in the sambhogakaya form of a bodhisattva, or in the nirmanakaya form of an enlightened Buddha. 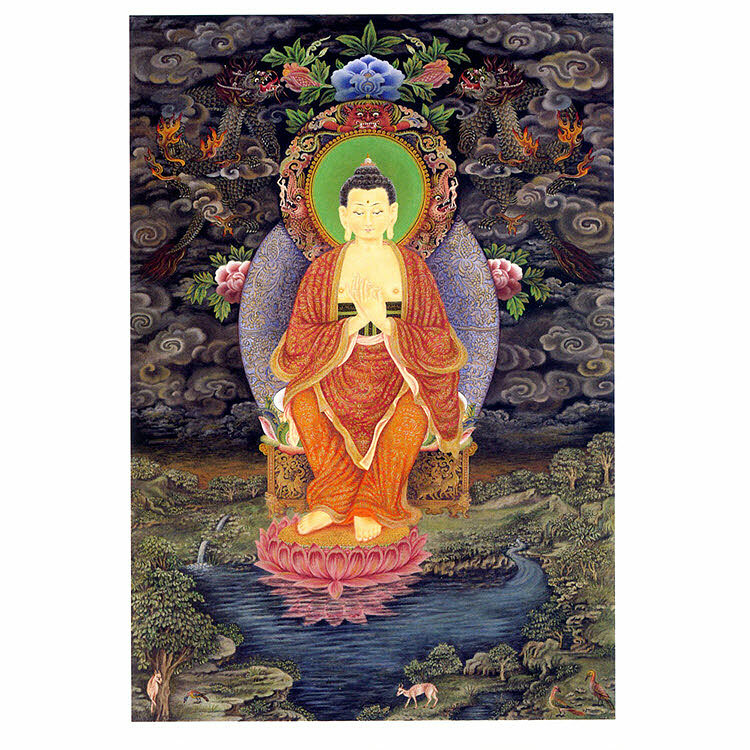 In occidental fashion Maitreya appears here seated upon a moon disc, a lotus and an ornate throne, with his feet resting upon the seed-head of a pink lotus that floats above a rippling pool. He wears the three red robes of a Buddhist monk, and his hands are held before his heart in the teaching gesture known as 'turning the Wheel of the Dharma' (Skt. 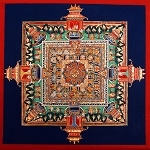 dharmachakra-mudra). His features are serene and beautiful, and upon the ushnisha or 'wisdom protuberance' that crowns his head is a small lotus-mounted white stupa. His ornate halo is adorned with two crocodiles or makaras with naked human figures in their jaws, and the crowning serpent-devouring head of kirtimukha. Two dragons writhe amongst the clouds in the background, while deer and birds wander fearlessly in the lower landscape's luxuriant foreground.